Polcyn, M. J., L. L. Jacobs, and A. Haber. 2005. 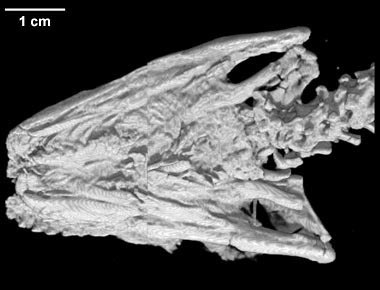 A morphological model and CT Assessment of the skull of Pachyrhachis problematicus (Squamata, Serpentes), a 98 million year old snake with legs from the Middle East. Palaeontologia Electronica 8:26A:24p. Pachyrhachis problematicus is a snake with well-developed hind limbs known from two specimens from the Cenomanian of the Middle East. One specimen has a complete and articulated, albeit crushed skull. The second specimen has a disarticulated skull crushed beneath the body. Pachyrhachis has recently been at the center of a debate on the origins and relationships of snakes, specifically whether Pachyrhachis is the sister taxon to all other snakes, or alternatively, a relatively advanced snake allied with boids and pythonids. Workers using the same specimens arrived at different interpretations of the morphology underlying the alternative hypotheses. The most complete skull was resin-embedded and acid-prepared for its original study nearly three decades ago, rendering the dorsal surface difficult to view using optical techniques, and thus significantly hampering later studies. This study utilizes CT scanning and computer reconstruction to test conflicting interpretations of morphology and thus provides a method to falsify alternative phylogenetic hypotheses. Pachyrhachis is found to possess an inclined quadrate with a well-developed stylohyal process and lacking a suprastapedial process, no squamosal, and a single mental foramen. The separation of exoccipitals above the foramen magnum cannot be demonstrated. There is no jugal. Confirmed morphology best supports the phylogenetic hypothesis that Pachyrhachis is a basal macrostomatan snake. Limb retention in a basal macrostomatan snake implies that loss of hind limbs occurred multiple times within Serpentes. This specimen was collected from a limestone quarry at Ein Jabrud (Bed-Meir Formation, lowermost Cenomanian, mid-Cretaceous), 20 km north of Jerusalem, Israel. It was scanned by the University of Texas High-Resolution X-ray CT Facility for Dr. Lou Jacobs of Southern Methodist University and Dr. Mike Polcyn of the Institute for the Study of Earth and Man. Partial funding for image processing was provided by a National Science Foundation Digital Libraries Initiative grant to Dr. Timothy Rowe of The University of Texas at Austin and a National Science Foundation Assembling the Tree of Life grant (EF-0334961), The Deep Scaly Project: Resolving Squamate Phylogeny using Genomic and Morphological Approaches, to Drs. Jacques Gauthier of Yale University, Maureen Kearney of the Field Museum, Mike Lee of the University of Adelaide, Jessie Maisano of The University of Texas at Austin, Tod Reeder of San Diego State University, Olivier Rieppel of the Field Museum, Jack Sites of Brigham Young University, and John Wiens of SUNY Stonybrook. The specimen was scanned by Richard Ketcham and Cambria Denison on 19 September 1997 along the coronal axis for a total of 308 slices. Each slice was 0.24 mm thick, with an interslice spacing of 0.20 mm (for a slice overlap of 0.04 mm) and a field of reconstruction of 70 mm. A problem during scanning resulting in the missing slices seen in the accompanying images and animations. Andrews, R. C. 1921. A remarkable case of external hind limbs in a humpback whale. American Museum Novitates 9:1–6. Bejder, L., and B. K. Hall. 2002. Limbs in whales and limblessness in other vertebrates: mechanisms of evolutionary and developmental transformation and loss. Evolution & Development 4:445–458. Caldwell, M. W. 1999. Squamate phylogeny and the relationships of snakes and mosasauroids. Zoological Journal of the Linnean Society 125:115–147. Caldwell, M. W. 2000. On the phylogenetic relationships of Pachyrhachis within snakes: a response to Zaher (1998). Journal of Vertebrate Paleontology 20:187–190. Caldwell, M. W., and M. S. Y. Lee. 1997. A snake with legs from the marine Cretaceous of the Middle East. Nature 386:705–709. Caldwell, M. W., and A. Albino. 2002. Exceptionally preserved skeletons of the Cretaceous snake Dinilysia patagonica Woodward, 1901. Journal of Vertebrate Paleontology 22:861–866. Cohn, M. J., and C. Tickle. 1999. Developmental basis of limblessness and axial patterning in snakes. Nature 399:474–479. Cope, E. D. 1869. On the reptilian orders Pythonomorpha and Streptosauria. Proceedings of the Boston Society of Natural History 12:250–266. Estes, R., T. H. Frazzetta, and E. E. Williams. 1970. Studies on the fossil snake Dinilysia patagonica Woodward. Part I. Cranial morphology. Bulletin of the Museum of Comparative Zoology 140:25–74. Estes, R., K. de Queiroz, and J. Gauthier. 1988. Phylogenetic relationships within Squamata. In Estes, R. and Pregill, G. (eds), Phylogenetic Relationships of the Lizard Families: Essays commemorating Charles L. Camp. Stanford University Press: Stanford, California, pp. 119-270. Haas, G. 1979. On a new snakelike reptile from the Lower Cenomanian of Ein Jabrud, near Jerusalem. Bulletin du Muséum national d’Histoire naturelle, Paris (Series 4) 1:51–64. Haas, G. 1980a. Pachyrhachis problematicus Haas, snakelike reptile from the Lower Cenomanian: ventral view of the skull. Bulletin du Muséum national d’Histoire naturelle, Paris (Series 4) 2:87–104. Haas, G. 1980b. Remarks on a new ophiomorph reptile from the lower Cenomanian of Ein Jabrud, Israel, p. 177–192. In Jacobs, L.L. (ed. ), Aspects of Vertebrate History, Museum of Northern Arizona Press, Flagstaff, Arizona. Lee, M. S. Y. 1997a. On snake-like dentition in mosasaurian lizards. Journal of Natural History 31: 303-314. Lee, M. S. Y. 1997b. The phylogeny of varanoid lizards and the affinities of snakes. Philosophical Transactions of the Royal Society of London B 352:53-91. Lee, M. S. Y., and M. W. Caldwell. 1998. Anatomy and relationships of Pachyrhachis problematicus, a primitive snake with hindlimbs. Philosophical Transactions of the Royal Society of London B 352:1521–1552. Lee, M. S. Y., J. D. Scanlon. 2002a. The Cretaceous marine squamate Mesoleptos and the origin of snakes. Bulletin of the Museum of Natural History, London 68(2):131–142. Lee, M. S. Y., and J. D. Scanlon. 2002b. Snake phylogeny based on osteology, soft anatomy and ecology. Biological Reviews 77:333–401. Newtek Inc. 2004. Lightwave 3D. Newtek Incorporated. San Antonio, Texas. Rage, J. C., and F. Escuillie´. 2000. Un nouveau serpent bipède du Cénomanien (Crétacé). Implications phylétiques. Comptes Rendus de l’Académie des Sciences de Paris, Sciences de la Terre et des Planètes 330:513–520. Rasband, W. 2003. ImageJ version 1.31. National Institutes of Health. Bethesda, Maryland, USA. Rieppel, O., and M. Kearney. 2001. The origin of snakes: limits of a scientific debate. Biologist 48:100–114. Rieppel, O. 1979. A cladistic classification of primitive snakes based on skull structure. Z. Zool. Syst. Evolutionsforsch. 17:140-150. Rieppel, O., and H. Zaher. 2000a. The intramandibular joint in squamates, and the phylogenetic relationships of the fossil snake Pachyrhachis problematicus Haas. Fieldiana, Geology 43:1–69. Rieppel, O., and H. Zaher. 2000b. The braincases of mosasaurs and Varanus, and the relationships of snakes. Zoological Journal of the Linnean Society 129:489–514. Rieppel, O., H. Zaher, E. Tchernov, and M. J. Polcyn. 2003. The anatomy and relationships of Haasiophis terrasanctus, a fossil snake with well-developed hind limbs from the mid-Cretaceous of the Middle East. Journal of Paleontology 77(3):536–558. Tchernov, E., O. Rieppel, H. Zaher, M. J. Polcyn, and L. L. Jacobs. 2000. A fossil snake with limbs. Science 287:2010–2012. Underwood, G. 1967. A contribution to the classification of snakes. British Museum (Natural History) 653:1–179. VayTek, 2000. Voxblast 3.0. Image Analysis Facility. University of Iowa, Ames, Iowa, USA. Whiting, M.F., S. Bradler, and T. Maxwell. 2003. Loss and recovery of wings in stick insects. Nature 421:264–267. Wiens, J.J., and J. L. Slingluff. 2001. How lizards turn into snakes: A phylogenetic analysis of body-form evolution in anguid lizards. Evolution 55(11):2303–2318. Zaher, H. 1998. The phylogenetic position of Pachyrhachis within snakes (Squamata, Lepidosauria). 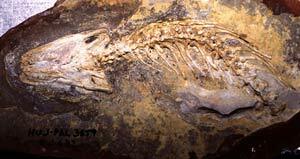 Journal of Vertebrate Paleontology 18:1–3. Zaher, H., and O. Rieppel. 1999a. Tooth implantation and replacement in squamates, with special reference to mosasaur lizards and snakes. American Museum Novitates 3271:1-19. Comparison of dorsal and ventral CT reconstructions illustrating alignment of dorsal and ventral structures. Animation sequence illustrating taphonomic affects on the preservation of Pachyrhachis problematicus (HUJ-PAL 3659). Digital reconstruction of the quadrate of Pachyrhachis problematicus. Animation sequence showing extraction of region of interest, rotation of region of interest, removal of elements other than quadrate, removal of crushing of the quadrate, and rotation of restored quadrate. To cite this page: Dr. Mike Polcyn, Louis L. Jacobs and Annat Haber, 2005, "Pachyrhachis problematicus" (On-line), Digital Morphology. Accessed April 19, 2019 at http://digimorph.org/specimens/Pachyrhachis_problematicus/.